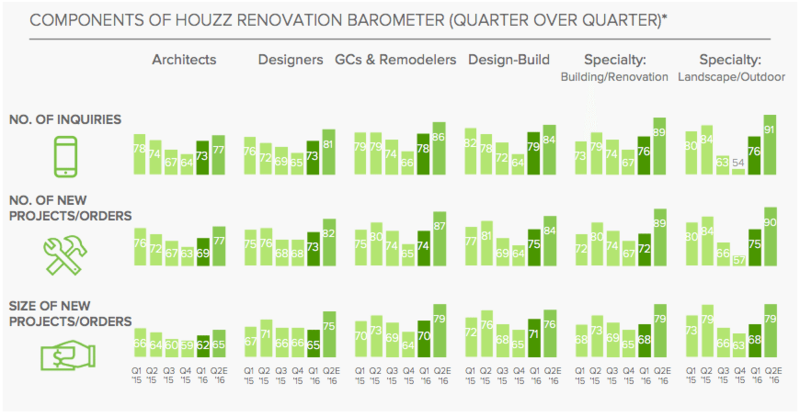 Houzz released its Q1 Renovation Barometer, a report that tracks confidence in the home renovation market among a range of industry professionals. Houzz reported quarter-over-quarter and year-over-year increases in market confidence among design professionals, and they predict a "rosy" second quarter as well. Houzz released its Q1 Renovation Barometer, a report that tracks confidence in the home renovation market among a range of industry professionals, such as interior designers, architects and professional landscapers.
.@houzz: Renovation/Design industry professionals are confident in the market. The report, which records differences in year-over-year and quarter-over-quarter market improvements, showed high first quarter readings, ranging from 68 to 75 out of a 100. According to Houzz, this year’s quarter one numbers are in line with 2015’s report and should set the stage for an equally impressive second quarter. Q1 readings are 68–75 out of 100, and Q2’s readings should be just as impressive. The 2016 Q1 barometer showed 6 to 26 percent quarter-over-quarter increases in optimism and confidence from the final quarter of 2015. Furthermore, the majority of firms that participated in the study reported quarter-over-quarter increases in the number of inquiries, the number of new projects and the size of those projects. Design-Build firms led the way with the highest number of inquiries (79), number of new projects (75) and size of new projects (71). Design-Build firms led the way in quarter-over-quarter numbers. In terms of the variances among the four major regions, firms in the West reported the least amount of confidence in the market. Out of all the categories, architect firms had the weakest confidence with a score of 67. Houzz says the low numbers are most likely due to rainier weather conditions in the early parts of the year. Year-over-year market gains in confidence continue to be high, despite four (designer, architect, design-build, specialty building/renovation) industries reporting slightly weaker scores from the first quarter of 2015. 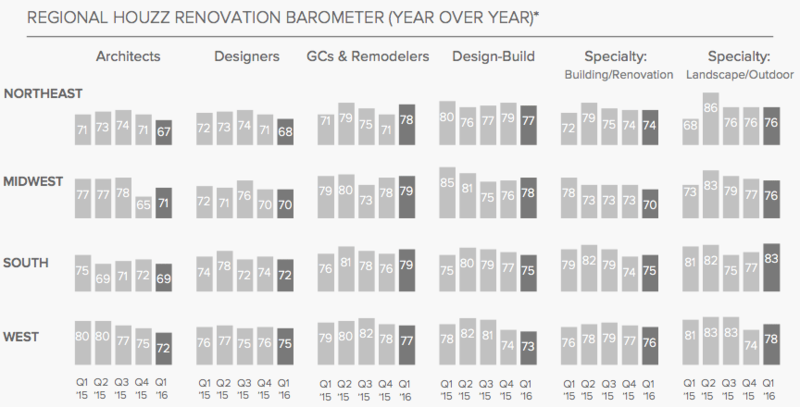 In year-over-year business metrics, GC/Remodelers fared the best with a score of 81 for new inquiries and a score of 75 for the size of new projects. Landscape/Outdoor firms led the way in the number of new projects with a score of 81. The Northeast region reported the highest level of confidence in year-over-year market gains with scores ranging from 67 to 78. GC/Remodelers and Landscape/Outdoor firms had the highest year-over-year numbers.